A delightful, rural retreat, ideally positioned very close to the Blickling Estate. Delightful views over a quintessential English vista of oak trees and meadows. 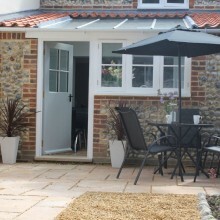 Easy access to the coastline, Norfolk Broads and Norwich. 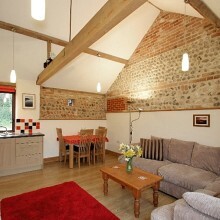 Apple Tree Barn has been carefully converted to a beautiful traditional brick and flint cottage. 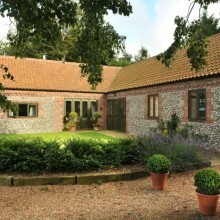 The stylishly decorated barn offers a tasteful, relaxed style, right in the heart of north Norfolk. A very comfortable detached family holiday cottage with open fire, conservatory, summer house and off-road parking. 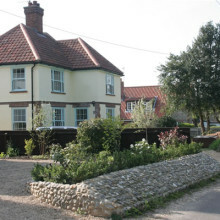 Situated in the village of East Runton between Cromer and Sheringham, nestled in beautiful surrounding countryside. And less than a mile to the beach! 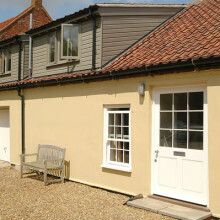 Beach Retreat is a cosy fisherman’s cottage located in Overstrand, north Norfolk. 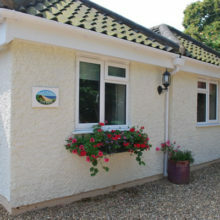 The property offers guests comfortable holiday accommodation in a super seaside location. Panoramic sea views and a short walk from the beach, this newly renovated cottage has lots of light, space and comfort. South facing, with panoramic sea views (and just a short stroll from the beach). 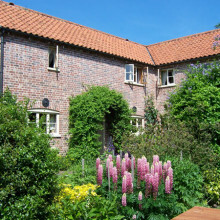 Beck Cottage offers comfortable and well equipped holiday accommodation for up to 4 people. 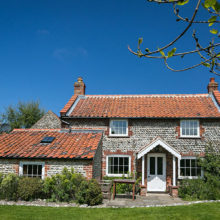 Located just outside the popular seaside town of Sheringham, the holiday cottage is ideally situated to discover the beautiful north Norfolk coast and pretty villages nearby. 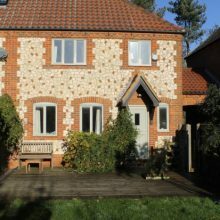 The Bolt Hole is a cosy retreat, a single storey property built from traditional Norfolk flint with a spacious garden and open plan living space. 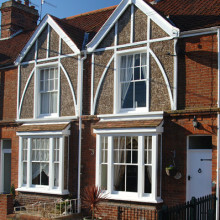 Located close to Sheringham Park and popular beaches. 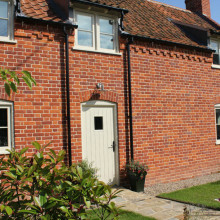 Bridge Cottage was once a mill worker’s cottage and is located in a historical part of Aylsham. 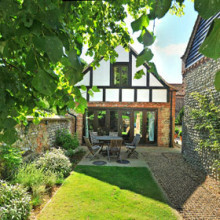 The cottage boasts many original features and has a charming courtyard garden. The Blickling Estate is less than 2 miles away. 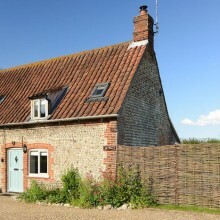 Chaff House at Rookery Farm offers comfortable, contemporary self-catering accommodation in a tranquil coastal location. Natural light streams through the barn’s glazed door into the large living area. Superb position overlooking the reed beds, bird sanctuary and beaches of Cley and Salthouse. 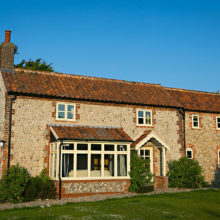 Luxury 200 year old Norfolk flint cottage, recently renovated and lovingly restored. 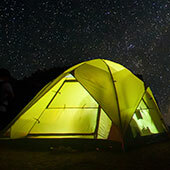 Perfect for a large family, group or two small families to holiday together. 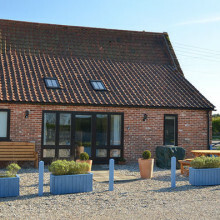 Flagstaff Boathouse offers breathtaking views of the beautiful north Norfolk coast – and luxury self-catering holiday accommodation beside the sea, at Burnham Overy Staithe, a stunning part of north Norfolk. 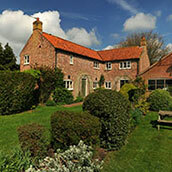 Luxury holiday accommodation on the very edge of the north Norfolk coastline. Stunning views. All bedrooms and wash facilities are located on the ground floor. 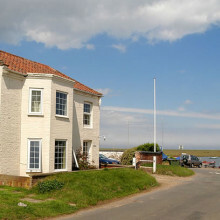 Located directly next to a creek on the beautiful north Norfolk coast this accommodation is perfect for guests that love sailing. 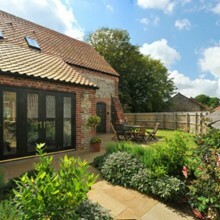 It has an open fire and is located close to Burnham Market and Wells-next-the-Sea. 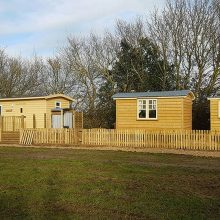 Single storey holiday accommodation, ideal for couples and guests who are less mobile. 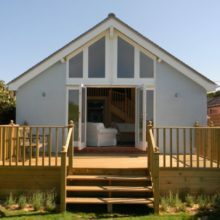 It’s located directly on the beautiful north Norfolk coast and is the perfect retreat for a quiet, romantic and peaceful holiday. 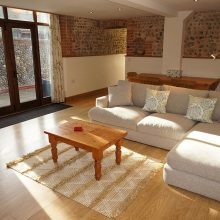 Luxury self-catering holiday accommodation on the beautiful north Norfolk coast, directly next to a sandy creek – an ideal spot to paddle – or at high tide, to go sailing. A large Victorian house tastefully renovated and finished to a high standard. 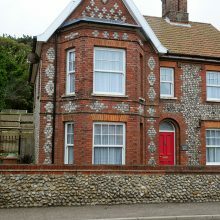 The property is located in the heart of Overstrand on the north Norfolk coast and provides guests with luxury holiday accommodation. Garden Cottage is a flint and brick cottage in West Beckham. This pretty cottage forms part of a small group of old farmworkers’ cottages and is an ideal cosy retreat at any time of the year. 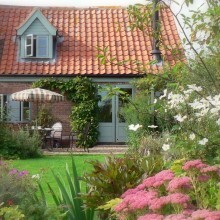 Gardeners Cottage is a delightful holiday retreat tucked away in the traditional seaside village of Overstrand. The cottage is situated on a quiet lane, ‘The Londs’ which leads directly to the beach and is perfect for making the most of this seaside location! 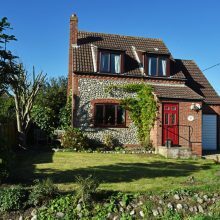 A pretty, single storey property in the village of Overstrand. 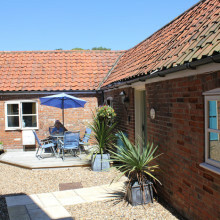 Ideal base to explore the north Norfolk coast – very close to the sandy beach and village amenities. 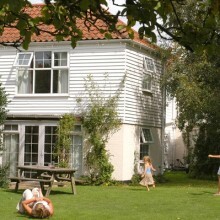 Enjoy a great family holiday at Green Cottage in East Runton on the lovely north Norfolk coast. This property is full of character with exposed beams, flint interior walls and a south facing private garden. 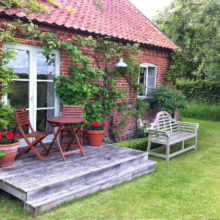 Hardy’s Cottage is a delightful cottage located in the traditional fishing village of Overstrand, on the north Norfolk coast. 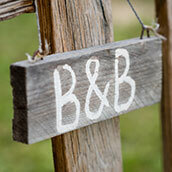 It’s a perfect holiday retreat for couples and young families. Hill Cottage is a magical little flint and brick cottage, tucked away, yet within a 5 minute walk from the Georgian town of Holt. It’s the perfect hideaway for a cosy romantic getaway or a therapeutic break. 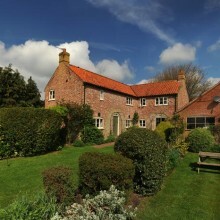 An award winning 5 star holiday cottage in the peaceful village of Aylmerton, very close to Felbrigg Park, north Norfolk. Finished to a very high standard and offering luxury accommodation. Situated in a remarkably well equipped rural village and surrounded by scented hedges and rolling fields, this is the perfect location for a quiet restful retreat. The perfect place to holiday with extended family or for friends to reunite! 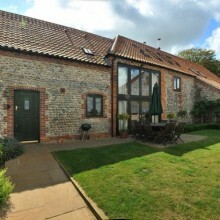 Long Barn is located on Rookery Farm in West Beckham, an ideal base to explore the north Norfolk coast. This delightful cottage offers guests a tranquil holiday in a rural setting with stunning south facing views of the grazing marshes. 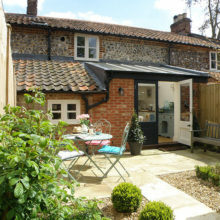 Perfectly positioned for exploring the Norfolk Broads, the sandy beaches (with seal colonies) and the city of Norwich. 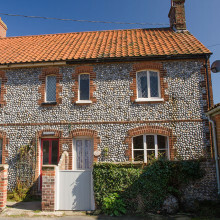 This pretty brick and flint Sheringham cottage is ideally situated. Close to Priory Maze & Gardens – and ‘Beeston Bump’. Ideal for exploring the coastline, east and west. 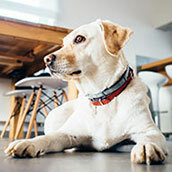 Dogs welcome. 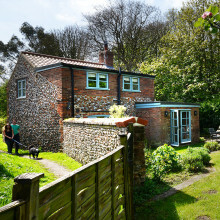 A traditional brick and flint seaside cottage located in Overstrand, north Norfolk. 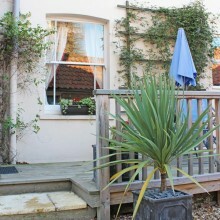 With an airy conservatory and an attic room this is a great place to enjoy a fun family holiday. Light and bright with stunning country views. Has a lovely, big living area with a glassed wall that folds back to let the garden inside. 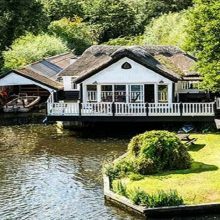 Southover is a detached ‘Arts & Crafts’ cottage positioned on the banks of the river Bure. 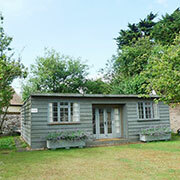 It sleeps 10 (ideal for large families or groups) and has been refurbished to a high standard. The property also has a lawned garden with an outdoor hot tub. Explore the Norfolk Broads with use of a 5 seat boat, plus two canoes. 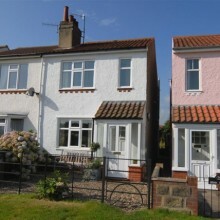 Staithe View holiday cottage at Burnham Deepdale is opposite the popular Dalegate Market. Closeby is the RSPB centre at Titchwell Marsh and the beautiful beach at Brancaster. It’s a great base for exploring the north Norfolk coast, including Holkham estate and Sandringham. Bird watchers can look out across the salt marshes and spot birds from the back bedroom window! Perfect for couples and families. 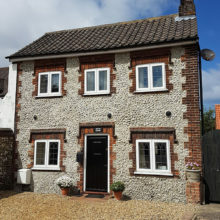 Located in the pretty hamlet of Wickmere, north Norfolk, this cottage is one of a pair and is ideal for couples or small families. 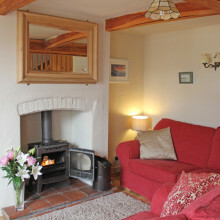 Together with Swallow Cottage 2 this property is suitable for larger groups to holiday together. The second cottage of a joined pair at Wickmere in Norfolk. Swallow Cottage no. 2 is every bit as welcoming and homely as its partner – a perfect place to relax and unwind. 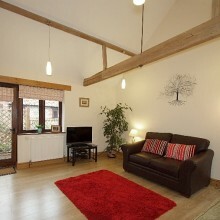 This property is a beautiful holiday cottage and many years ago the cows lived here and were gently milked by hand. 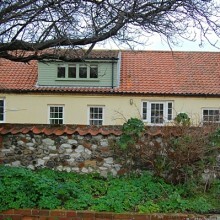 The Old Bakehouse is located in the seaside village of Overstrand, just over one mile east of Cromer. This spacious accommodation was once the village bakery and now offers visitors a relaxing holiday in beautiful surroundings. At Manor Farm you’ll be given a rare opportunity to live in a pigsty – not any old pigsty we hasten to add – and definitely not an absolute pigsty, but The Pigsty, perhaps the most luxurious cottage accommodation of its kind in the country! The Tractor House is a characterful cottage, sleeping 8, with warm brick and cobblestone exterior walls that once sheltered the farm’s tractors. Pause for a moment and consider a well-earned break in one of these lovely shepherd huts, ‘Serenity’ and ‘Tranquility’. 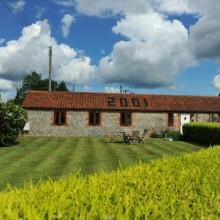 Centrally located in north Norfolk and only 9 miles from the coast. 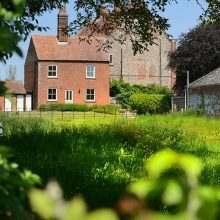 Victoria House and Annexe can be booked together at a discounted rate, perfect for larger families and groups of friends. Ideally positioned to explore the north Norfolk coast, the regular bus service stops almost outside the door. Its village position means everything is close by including Cromer and Sheringham, plus the beach is just across the road! Walnut Tree Barn is a stylishly decorated holiday cottage that has been carefully renovated and decorated in a tasteful and relaxed style. This impressive property is ideal for large family group holidays and special occasions. A traditional brick and flint single storey barn conversion, part of Rookery Farm in West Beckham. Wash House has a wood burning stove for cosy nights in and a private south west facing garden which is ideal for summer ‘alfresco’ dining. 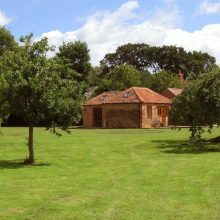 A delightful, secluded retreat set in its own private one-acre garden in west Norfolk. Very close to the Royal Sandringham Estate, Houghton Hall, Castle Rising, Castle Acre. 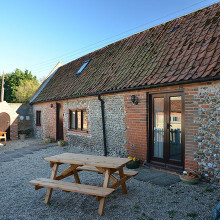 Ideal for exploring the north Norfolk Coast. 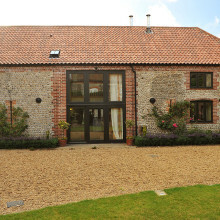 A grand, two storey brick and flint barn – perfect for large family holidays, with its bright and airy living space. Private patio leads to a south west facing rose garden – a great place for summer dining. Advertise here for only £32 a year.